The Eve Online Division has been making some major moves in their game! They have added 18 pilots from both the EU and NA timezones in its division. In addition, many TAW members from other divisions are helping and contributing to the corporation growth in game. Thanks to Veridical (current Arma Division member and the Division IT director), the Division has a new EVE related website. If you are a current TAW member, playing EVE and you are interested in joining the corporation in game, please talk to Avguste [EVE SUL]. A lot has been happening this month for the Ring of Elysium Division, both in TAW and within the game itself. They recently hosted a large multi-clan match of King of the Hill and have even began forming a competitive team, the team has not yet completed in any competitive events however they have been training tirelessly to improve themselves! The division has also celebrated some promotions within its ranks; Bitzyboo is now the ROE 1 Staff Officer, EvoDeviant is now the ROE 1 (temporary ROE 2) PIA and LegendOneSix is the new ROE 1 Training Specialist! As far as the game itself Ring of Elysium has introduced a large amount of cosmetics to the game and after suffer a temporary drop in players due to the release of new battle royale games they have implemented measures to fix lobby wait times and their dev team has been working with players in order to improve the game (mainly through patches, weapon/kit buffs and cracking down on hackers in order to create a fun environment for all players). As of 17 February solo and duo modes have been temporarily locked on NA servers in order to improve lobby wait times and Tencent has encouraged players to use this as an opportunity to make new friends! For those wanting to play duo and solo the game modes remain open on EU and AS servers. As of 23 February the Dev Team introduced a new daily check in event and add a free adventure tiers event, some of the prizes include a donut accessory and an XP boost card! The Dev Team has also teased players with a new assault rifle, special game modes, buffs, prizes and of course new character skins that will be introduced in the future. The Ring of Elysium division remains optimistic about the future of this unique battle royale! If you would like more info on this game feel free to contact Kronos [ROE SUL]. This is an allstar team as they are communicating very well with each other and with Vanguard staff. The team has recently put in place it’s 2 Mandatory events, which last 2 hours each Saturdays at 2-4pm EST and 9-11pm EST. The team is now working on getting it’s recruitment posts in place and working towards actively recruiting and growing. If you own ESO, feel free to drop into the ESO Division Channels up in Vanguard and join them for some PvP or Dungeon runs. If you would like more info on this game feel free to contact Airiswolf [ESO SUL]. A Few things are happening with the Conan Exiles team! A great addition that they are working on is evaluating potential mods to be brought into the TAW Conan server! This is a big deal because it could potentially bring in a host of new recruits! Also when speaking of recruits the team has one recruit who has met the requirements and has thus been promoted to PFC! Congratulations from myself on behalf of the Vanguard team Yendro! If you would like more info on this game feel free to contact PHI [CE SUL]. Apex Legends [APL] Spin Up Meeting is slated for MAR 3rd, 2019, at 2:00 PM EST. We hope to see many of you there for the launch of this fantastic game. If you have any questions, please contact any of the Vanguard Staff! Rust is a multiplayer-only survival video game developed and published by Facepunch Studios for Microsoft Windows and macOS. First released through Steam Early Access in 2013, the game saw a full release on February 8, 2018. During the course of its five year development, the game saw several major changes to the core gameplay and other elements, notably being ported to the Unity 5 engine to improve the graphics. Rust was initially created as a clone of DayZ, a popular mod for ARMA 2, with crafting elements akin to those in Minecraft. If interested in bringing this game into TAW please make sure to fill out the Vanguard Interest Form. Hello everyone! With great pleasure I would like to announce that all weekend Runescape is having a Double xp weekend. Twice the xp rate in a game as grindy as Runescape can really make a difference in leveling up so if your having a hard time getting them levels then now is the time to play! Double XP Weekends are events where players receive twice as much experience from most training activities. Double XP Weekends usually run twice a year, in February and September, beginning on a Friday and ending on the following Monday. Congrats to New Vanguard Server Administrator! On behalf of Zenmire, Rekon, DrFajitas, and Hemphop, I would like to announce that we have accepted a great leader within the TAW ranks for the Vanguard Server Administrator position! He is Very dedicated to the community and is a great addition to the team! Without further ado we would like to announce that Bfouronine has stepped up into the position of Vanguard Server Administrator! We are excited that he has accepted the offer and are overjoyed to see the amazing things he will do for the Vanguard and Vanguard Horizon teams! As always if you have permissions of AL and higher when you log on please make sure to congratulate him in true TAW fashion to a good old boot! OOOOOOOORAAAAAAAH!!! A last OOOOORAAAAH mandatory event from the SUL and some of the FN members is being put on tomorrow 1800-2000 GMT or 1300-1500 EST where one of our old members Shooky who is now a Fortnite pro-league player had gotten access to his own private server! 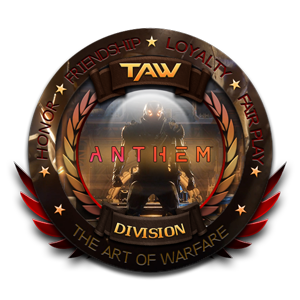 We will be hosting a TAW wide Tournament in private lobbies where its just TAW Vs. TAW! If you want in on the action make sure to drop in at 1pm EST or 6pm GMT! The Format will be Solo games and there will be about 10 or more games played! Who will come out as victor? We shall see tomorrow 1800-2000 GMT, 1300-1500 EST! It’s time for February's On The Horizon Post, for those of you not aware of what that is. In Vanguard every month we list several games that Vanguard feels would make a great place in TAW, and we publish them in a blog. Most titles are newer but there are some older ones as well that we feel would be good in our community. Also keep in mind that these games may be the future of TAW so if you have any interest in any of these games or any others, fill out the Vanguard Interest Form please. In Neverwinter, explore and defend one of the most beloved cities from the Dungeons & Dragons Forgotten Realms campaign setting, as it rises from the ashes of destruction. Epic stories, action combat and classic role playing await those heroes courageous enough to enter the fantastic world of Neverwinter! You don’t have to pay to adventure in Faerûn. All playable content from level 1 to level cap is completely free to experience! Whether you play table-top or immerse yourself in Dungeons & Dragons stories, experience iconic locations, classes, and encounters — with both heroes and villains — on your journey through the Forgotten Realms. Move swiftly and boldly through your encounters to maximize your combat effectiveness. Every attack, ability, and dodge will require planning, reflexes and precise execution. Level up six unique classes - Gunslinger, Hellraiser, Slasher, Medic, Fixer, and Exterminator - each with their own unique perks and play styles. Customize powerful weapons to survive higher difficulty challenges. Humanity is on the brink of extinction. From New York, to Moscow, to Jerusalem, the undead apocalypse continues to spread. Countless millions of ravenous zombies without feeling or fear overwhelm and infect the embattled survivors of World War Z. As the end looms, a hardened few band together and endure. Alone, we are easily overcome. Together, we may yet bring down the horde and press on. In-game Zombie Hordes behave like real crowds, getting stuck in narrow corridors and climbing on top of each other to reach players on higher levels. Hordes become increasingly more difficult to defeat and behave like single entity bosses as players progress through the game. From the creators of ARK: Survival Evolved comes ATLAS - a massively multiplayer first-and-third-person fantasy pirate adventure. ATLAS will host up to 40,000 players exploring the same Globe simultaneously, with an unprecedented scale of cooperation and conflict! Stake your claim in this endless open world as you conquer territory, construct ships, search for buried treasure, assemble forts, plunder settlements and hire crew to join your powerful growing armada. Start small then expand your spheres of influence from a small island, up to an unstoppable pirate empire that spans across the oceans. Wage battle against enemy fleets as you single handedly command large ships of war using the captaining system (or divide up to the responsibilities among your trusted lieutenants), or take control of any weapon directly with your own character. Dive deep into the briny water to explore permanent sunken wrecks and recover salvage, unearth the loot from procedurally-generated Treasure Maps and challenge zones, or complete challenging main questlines. Team up with other aspiring adventurers and sail into the vast ocean to discover new lands rich with region-specific elements, tame exotic natural and mythical creatures, raid forgotten tombs, confront powerful ancient gods and even build and administer your own colonies, cities, and civilizations to dominate the ATLAS in this ultimate quest for fortune and glory! Show ‘em what you’re made of in Apex Legends, a free-to-play Battle Royale game where contenders from across the Frontier team up to battle for glory, fame, and fortune. Explore a growing roster of powerful Legends, each with their own unique personality, strengths, and abilities. Choose your Legend, team up with two other players, and combine your unique skills to be the last squad standing. Master your Legend’s abilities, make strategic calls on the fly, and use your team’s strengths to your advantage in vicious 60-player matches. Again keep in mind that these games may be the future of TAW so if you have any interest in any of these games or any others, fill out the Vanguard Interest Form please. To celebrate the launch of Anthem Early Access, the Anthem Division will be holding a 24 Hour live-stream starting at 10 AM ET, on Friday, February 15th, until Saturday. We plan to play through the game, and hopefully answer all questions regarding the game to curious TAW members and community as well. If you are excited about the game, and plan to play it tomorrow, please feel free to hop into our Division TeamSpeak channels, located under Vanguard Horizon. We hope to see many of you there. You are also welcome to join our Division Discord to join in on the discussion and hype! Warframe is currently being spinup in Vanguard. Please feel free to drop by our ts channels and play with us. As we slowly reach our current max of 100 players, we need to make room for Warframe members and are purging all non TAW members. It is not our intent to kick any current TAW members, but we have to make room. Not sending an email could result in you being kicked from the dojo. If you are kicked and want back in please contact any member of the Warframe staff. As I stated above, we do not intend to remove TAW members ,but we need to know who you are. We are planning to upgrade our dojo to hold more members, but it takes time to farm the materials needed. i'm trying to find out if there's enough interest in having NeverWinter Online here in TAW so below is a brief description of the game as a whole, makers and content of the game. Neverwinter is a 3D action MMORPG set in the epic Dungeons and Dragons world of Forgotten Realms. Iconic locations such as Baldur's Gate, Icewind Dale, Neverwinter, and more await players in this story-driven MMORPG. The game features skill-based combat that requires players to aim individual attacks and dodge incoming attacks. Classically Familiar – Dungeons and Dragons-themed MMORPG with engaging, story-driven gameplay. Fun Combat System – action oriented combat. Skills and attacks must be aimed. Similar to Tera. Class/Race Variety – great pool of classes and races with 8 playable classes and 13+ races. Choose Your Own Adventure – Foundry system where players can create their own adventures. Players are rewarded for playing through these adventures too. Multi-currency System – with Gold and Astral Diamonds. Both can be obtained in game for free with diamonds being the more valuable currency. Hey guys I have been playing Dauntless off and on since the Founder's Alpha and was curious as to if anyone here plays? If you would like to play with me anytime just hit me up in teamspeak! The game currently is currently on its own launcher which you can find here : Dauntless. Powerful, wild, and ravenous for the aether that holds the Shattered Isles aloft, Behemoths are a threat to our very existence. Team up with other Slayers to confront these massive beasts before they consume what's left of our world. Discover your strengths and refine your skills as you fight alongside up to three other Slayers. Whether you choose to hunt with real-life companions or match with Slayers across the globe, you'll always have a friend in the fight. Harness the power of Behemoths you hunt by converting their parts into powerful armaments. Dyes, cells, and transmog stones let you further customize looks and loadouts to define your role as a legendary Slayer. Join millions of Slayers who call the Shattered Isles home. From the frontier settlement of Ramsgate to the turbulent reaches of the Maelstrom, there's so much to explore -- and so much worth protecting. If you are interested in playing this game in TAW please fill out the Vanguard Interest Form. Also Feel free to message me if you need more info on the game! Star Citizen Reaches Tier 2. Vanguard is proud to announce that the Star Citizen [SCZ] team has progressed to Tier 2 status! With this, they are now open for internal transfers. If you would like to transfer to the Star Citizen unit or attend events with the team, feel free to join them in their channels in Vanguard or talk to the Division Commander, Dperk, for more information. Fortnite Share the Love Event! Hey everyone! Fortnite is going to be having a valentine's day event called Share The Love! They are introducing in a promotional deal for content creators with Support-a-Creator codes to get them a little bit more cash flow by introducing an exclusive wrap for vehicles and weapons called Cuddle hearts as seen in the picture below! Fortnite is also introducing a new tournament mode where depending on how well you do per division the better you do the higher you advance through divisions! They will run several placement matches on the weekend of February 9 and 10, placing top performers directly into the higher divisions based on their performance. Some new features in the tournament system will be used during the “Share the Love” Competitive Series with more unlocking with the v7.40 update. Players will unlock the next division by earning a pin during any daily session. Players who manage to earn a pin during a Champion Division session will unlock access to the Champion Division Finals to take place February 23 and 24. On the 15-17th and the 22-24th Fortnite will also be having double xp weekends so if you haven't hit level 100 yet there’s your chance!!! One of the newest editions to our TAW family is Elder Scrolls Online. We not so much new, as it is making a return appearance. The team is currently focusing on building up it’s ranks on the NA server with already having a full complement of staff. Elder Scrolls Online is a MMORPG where you can create your character from one of the 9 selectable races and 5 selectable classes, with the 6th class Necromancer being added June 4th. But today is a great day for anyone who wants to get in on this game, as not only is it on sale on both Elder Scrolls Website but also on Steam. To Top it off, ESO has also just made the announcement that they are allowing members to try ESO Plus free for from Feb 2nd through until Feb 12th of 2019. If you have any questions, please feel free to direct them to the knowledgeable staff they have down in ESO who are always willing to help. On behalf of Zenmire, Rekon, And DrFajitas, I would like to announce that we have accepted a great leader within the TAW ranks for the Vanguard DO position! He has been in TAW for a substantial amount of time and has held positions all the way from DI to DC and has done great things for all the units that he has been apart of! Without further ado we would like to announce that Hemphop has stepped up into the position of Vanguard Division Officer! We are excited that he has accepted the offer and are overjoyed to see the amazing things he will do for the Vanguard and Vanguard Horizon teams! As always if you have permissions of TFO and higher when you log on please make sure to congratulate him in true TAW fashion to a good old boot! OOOOOOOORAAAAAAAH!! !